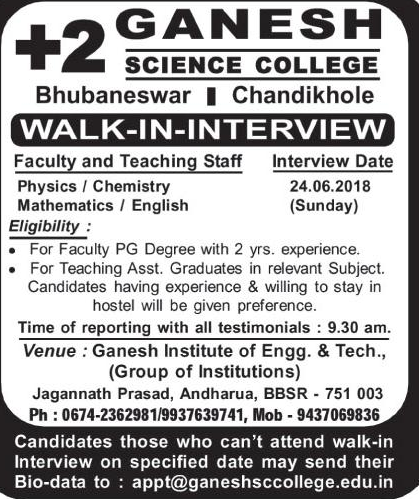 +2 Ganesh Science College, Bhubaneswar has advertised in Sambad newspaper for the recruitment of Faculty/Teaching Staff jobs vacancies. Interested and eligible job aspirants are requested to appear walk in on 24th June 2018. Check out further more details below. About College: GIET +2 Science college is a fast growing +2 science college of the state and a premier college of its kind to attract students for admission to this college because of the focused education curriculum.